Even though I had work at home, we had a great weekend, saw some friends, ate good food, did the tourist-y thing, enjoyed the sunshine and the beauty of the city and quite likely enjoyed our last little weekend getaway before the baby arrives. I'll show a few pictures throughout the week, since we took alot. Even though we were only there for a few days, we always seem to take photos. Hmmmm... more pictures to scrapbook before baby comes. It's a really great city, green and lush with lots to see and do. It's probably one of Canada's prettiest cities. I highly recommend it. When I got back, my parents came up for a visit and helped me with some chores. 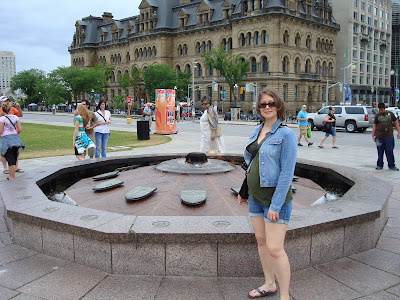 My mom came to my prenatal class with me, since Brad is still in Ottawa for a few more days, which was nice. It was good to have someone to share a grimace with during the videos. *Sigh* Now, back to work.